The 10th RoboCup German Open 2011 took place at MESSE MAGDEBURG from March 31, 2011 to April 3, 2011. Nearly 200 German RoboCup Junior teams from 60 locations in Germany participated in the RoboCupJunior qualification competition. 26 teams were nominated to take part in Istanbul. In addition, the German Open comprises an open tournament for international teams in the RoboCup Major Leagues. 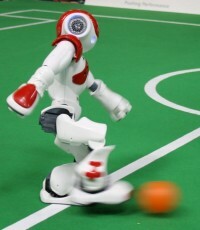 56 research teams from 14 countries participated in the RoboCup Major Competitions.